Fifa president Sepp Blatter and vice-president Michel Platini have had their appeals against 90-day bans rejected by world football governing body's appeal committee. They were suspended in October while Fifa's ethics committee investigates corruption claims against them. Blatter, 79, is accused of signing a contract "unfavourable" to Fifa and making a "disloyal payment" to Platini. Both deny wrongdoing and will appeal to the Court of Arbitration for Sport. Blatter's American lawyer, Richard Cullen, said in a statement: "President Blatter is committed to clearing his name and hopes this inexplicable delay is not an effort to deny him, during his elected term, a fair hearing before a neutral body." Platini will contact Cas by Friday and has "absolute confidence" in the Swiss court, lawyer Thibaud d'Ales said. "For the first time since he was suspended he knows that he will be treated in a completely independent and fair way," he added. Fifa secretary general Jerome Valcke was also suspended in October but there was no mention of him in Wednesday's Fifa statement. The adjudicatory panel of Fifa's ethics committee is due to hold hearings into the misconduct charges before Christmas. Who are the indicted Fifa officials? 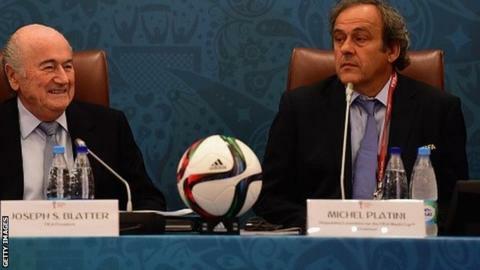 Platini's ban means his bid to succeed Blatter has had to be put on hold. He is one of seven candidates for the presidential election on 26 February but no integrity check will be carried out until his case is resolved.